As the annual Australia-United States Ministerial Consultations (AUSMIN) took place in Sydney earlier this week, there was no shortage of geopolitical flashpoints for officials to talk about. Russia has been quietly amassing troops along its border with Ukraine, Islamic State jihadists continue to commit violent acts of extremism in Northern Iraq, and renewed conflict between Israel and Palestine remains a constant possibility. Amid this potential instability, it is perhaps a reflection of the strength of the Australia-U.S. alliance that most of the media coverage had to do with how the two countries would respond to these and other global security challenges. But beyond the headlines were a number of important bilateral developments for what is arguably one of the closest strategic partnerships in the Asia-Pacific. AUSMIN brings together foreign and defense ministers from both countries to survey and map out the long-term strategic direction of the bilateral relationship. Top of the agenda this year was defense and security cooperation. The ministers signed the Force Posture Agreement, which was first announced in early 2011, creating a legal framework for the rotational deployment of up to 2,500 U.S. Marines to Darwin where they will conduct military exercises and training with their Australian counterparts. This also includes increased rotations of U.S. aircraft through Northern Australia in order to facilitate closer collaboration between the U.S. and Royal Australian Air Forces. 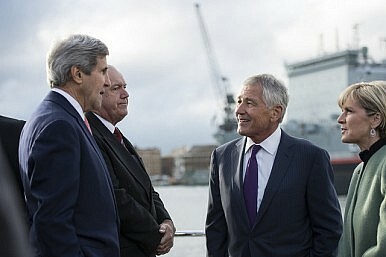 U.S. Secretary of Defense Chuck Hagel said that the agreement “will broaden and deepen our alliance’s contributions to regional security and advance America’s ongoing strategic rebalance in the Asia Pacific.” Australia’s Defence Minister David Johnston boasted that this aspect of the U.S. rebalance to the region is occurring “very seamlessly” and is a “classic win-win situation.” Australia benefits from the stability that U.S. leadership brings to the region and the U.S. gains from a reliable and credible partner, crucially located at a safe distance from any potential trouble spots in the East and South China Seas. Taken together, the initiatives reflect a steady increase in the capacity and interoperability of Australian and U.S. forces. The 2014 Joint Communiqué, for instance, notes the significance of the biennial Exercise Talisman Sabre in strengthening joint collective capabilities, maintaining joint defense readiness and enhancing Australia-U.S. interoperability. Long-discussed plans to increase cooperation over missile defense also took a step forward. The ministers agreed to “work together to counter the growing threat of ballistic missiles in the Asia Pacific region” but stopped short of announcing any specific plans yet for incorporating Australian Navy ships into America’s ballistic missile defense system. For now, Washington and Canberra will simply establish “a bilateral working group to examine options for potential Australian contributions to ballistic missile defense in the region.” But this is most likely to be the next big area for cooperation.